Samsung recently launched the Galaxy S5 and while it looks and feels very much similar to the previous device, it packs in a lot more. They have upgraded the hardware running inside the device. They have also added some additional features like a heart rate monitor for the data to be used by various fitness apps. At the price this device is on offer, it goes against the likes of iPhone 5S and the recently launched HTC One M8. Both these devices are strong rivals to the device and offer almost similar level of performance to the user. While the HTC One M8 betters the Samsung Galaxy S5 when we talk about built quality and design, it loses to it when it comes to display. The HTC One M8 has got quite an impressive display but as soon as you look at the AMOLED display on Galaxy S5, the rivals appear dull. It was expected to have a display with resolution higher than the one on S4 but it was good enough already. We take a closer look at this awesome display and the device housing it. We are always been a fan of AMOLED displays and Samsung is one of the very few manufacturers who prefer them over any other display type. But the design of Samsung devices is one of the many reasons I have been forced to go for some other brand. The design is very much similar to what we saw on the Galaxy S4 except for the few changes like slightly sharp corners (or less rounded we should say). It is made out of plastic just like most (or probably all) of the Samsung devices. The back however is slightly different. They have gone for a soft rubberised back with a faint pattern on the back. This definitely helps with the grip considering the device is huge and now slightly fatter than the previous device. The device is available in multiple colours. The soft back can be scratched easily but as it is a removable panel, you can easily find a replacement and put on a new back panel. You can also replace the battery yourself when it has aged as it is accessible to the user. The device is waterproof and this gets scary when you remember that it has got a removable back panel. It has got a large, really large back panel. It has got multiple locks to hold it in place and if you fail to put the panel back properly, it might ruin the device if you try to test its waterproof capabilities. So words of caution here, before you take it to the bath, make sure the panel is held in its place properly. This is the part we absolutely love about this device. The Galaxy S4 has got a 5 inch full HD AMOLED display which is superb. 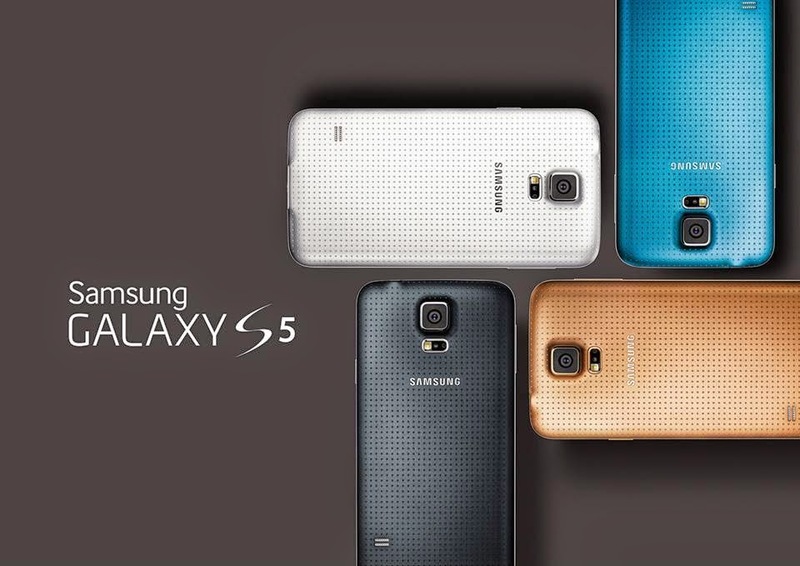 The S5 was rumoured to come with a display having even higher resolution but it came out with a 5.1 inch full HD display. do we have any complaints? Not at all. Full HD display is more than enough and you still get a superb pixel density. A higher resolution would have consumed extra power without any considerable advantage. They have slightly tweaked the display on this device and it is a bit brighter than the S4’s display. The display is just as good or maybe even better in some cases. The high pixel density means that it is very crisp and watching media content or browsing web is a great experience on this display. You will love this display even more when you use it in dark as the blacks are just superb. An AMOLED displays completely powers off the pixel when it is displaying black and this gives you the darkest possible blacks you can have. It is so good that in the dark, if the content is being displayed on a part of the screen, you will not be able to figure out where the borders of the display lie. It is not only the contrast that is impressive but the colours are very well saturated too. You thought Snapdragon 800 was powerful? Have the snapdragon 801 which is even more powerful. The quad core processor runs at a maximum clock speed of 2.5 GHz against the 2.26 GHz on Snapdragon 800. The Adreno 330 GPU also runs at a higher clock speed as compared to the 800. The device comes with 2 GB of RAM which is plenty. You can choose from 16 or 32 GB of storage and if that isn’t enough for you, you can get micro SD cards. The device offers a heart rate monitor which is a fresh feature here. The data provided by it can be used by various fitness apps to keep track of your health. It has also got a fingerprint scanner for device unlocking. The device has got a powerful 16 megapixel camera and while there is nothing very special with the camera sensor, there are other bits that make it special. The camera focuses on the subject insanely quick which can help you capture quickly. It can also record slow motion videos in full HD. As you would be collecting a lot of data on this device, you get USB 3.0 port for fast data transfer apart from the usual connectivity options. This is another powerful and impressive device from Samsung. It is a strong rival to all the other flagship devices out there with its superb display, impressive hardware and good camera but the design and built quality leaves a lot to be desired. If you can live with it or you have already found some really amazing case for the device, you can simply go ahead and pick this device. If you are already using a Galaxy S4, stick to it for a while as the Samsung Galaxy S5 isnt a very major update over it and wait for Samsung to drop another bomb before writing a cheque.